For those of us who have an modern iPod, iPad or iPhone: These devices are very capable of video playback, which is practical when you’re traveling … independently watch your movie selection, on the go, on your own device! The question now is how do I get a movie from my DVD or Blu-Ray for example onto my iPod, iPad or iPhone (or other iOS device like the AppleTV). In this article, I’ll show you in a few simple steps how to do this under Windows or MacOS X. Get your video – for example by downloading or copying a DVD or Blu-Ray movie. 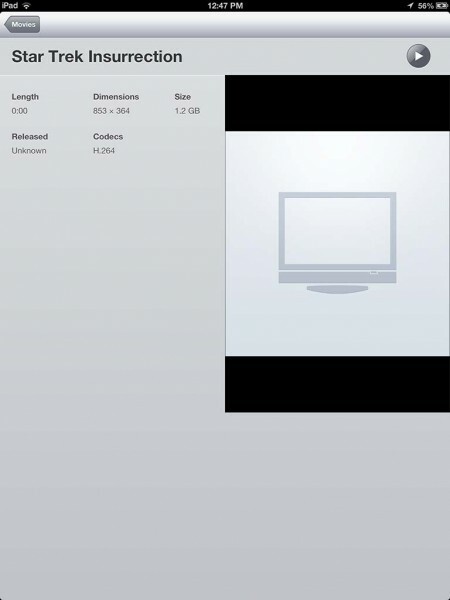 Add metadata to the video (add additional movie information – this is optional). Transfer the MP4 to your iPod, iPad, iPhone or AppleTV using iTunes. We need to, idealy, get out hands on a MP4 or M4V file. You may choose to download it or copy a DVD or Blu-Ray disc you own. I’ve written a few tutorials based on HandBrake on how to rip a DVD to MP4 file, and this is the first step you will have to follow. Note that you can also use HandBrake to convert AVI and MKV files to MP4 or M4V files! Once you have completed the ripping process, you should have a copy of your DVD in a MP4 or M4V file. Note that renaming the file to an M4V is advisable, since Apple software (like iTunes) seems to handle that better. With purchased video files on you iOS device, you might have seen the very nice additional info that is being displayed. Please look at the screenshots below that I took from my iPad to show you the difference between files without and with metadata added. As you can see: much more pleasant with the metadata, right? I wrote an article that explains how you can beautify your MP4 or M4V (and other formats) by adding metadata to video files. The article covers applications for Windows, MacOS X and Linux. 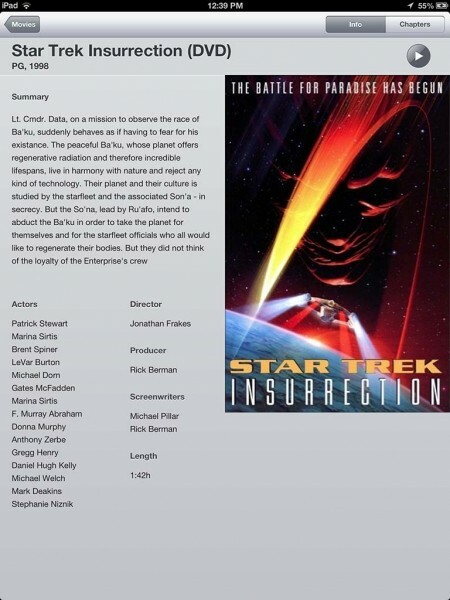 Article: Adding movie information (Metadata) to your MP4 or M4V. Adding metadata, or tagging, is fully optional! Transferring your newly made MP4 (M4V) file to you iPod/iPad/iPhone can be done in several ways. In this article we will use iTunes which works similar in both Windows and MacOS X. There is, unfortunately, no iTunes available for the Linux platform. Connect your iOS device (iPad/iPod/iPhone/AppleTV) through the USB cable to your computer. Select “Movies” on the left hand side under “LIBRARY” (1). 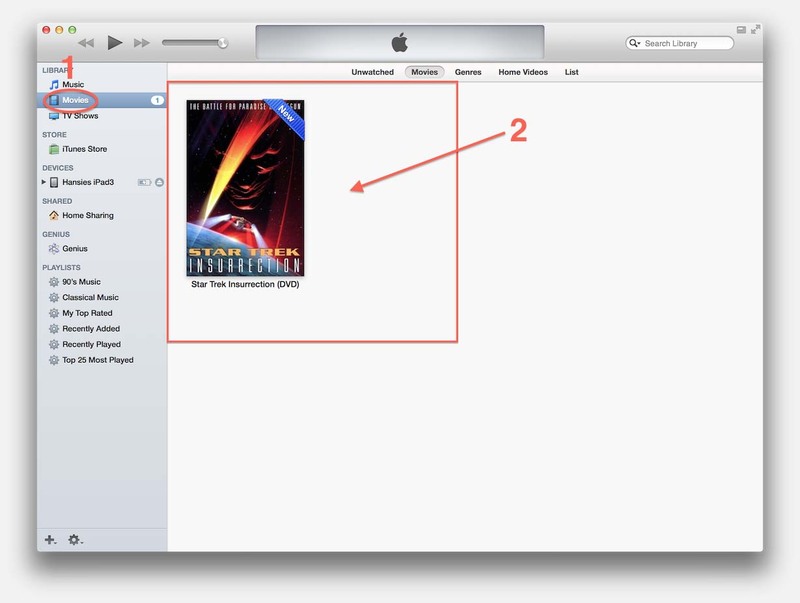 Drag and drop your movie(s) (MP4 or M4V) on the right side of the iTunes window (2). Click your iOS device on the left hand side under “DEVICES” (1). 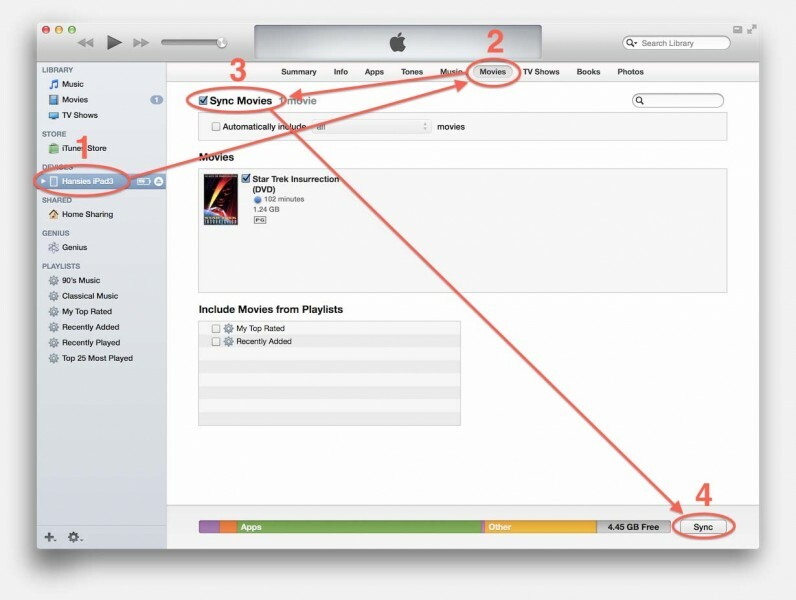 At the top part of your iTunes window click “Movies” (2) and make sure that “Sync Movies” (3) is checked (you can optionally limit the selection to only the movies you’d like to sync instead of all of them). Finally click the “Apply” or “Sync” button (4) in the lower right corner. iTunes will now perform a sync. 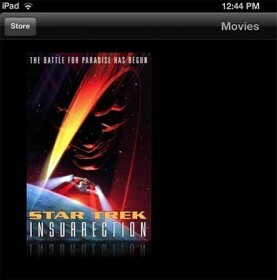 Once the sync is completed go to “Videos” on your iOS device, and your movie should be there. Sync: Erase and Sync? Excuse me!? Since the introduction of iCloud, I no longer use iTunes to sync my iOS devices. So when I do click “Sync” or “Apply”, in the previous steps, iTunes barks at me with the message that my device was not synchronized with another computer, and if I’d like to erase everything before syncing or cancel the sync. 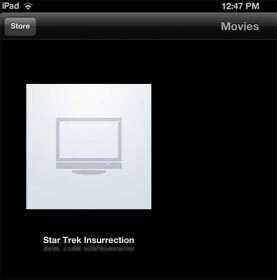 This also happens if you never synchronized your iOS device with iTunes before. But really dear Apple … WTF? Since I had to go through the steps for this article, I did bite the bullet after making sure my iCloud backup is up to date – iCloud is free (up to 5 Gb of non-Apple data like photo’s and movies). On your iOS device click “Settings” “iCloud” “Storage & Backup” “Back Up Now” (unless of course, you see a date/time below this button indicating that a recent update was done). Next open iTunes and make sure your iTunes is connected to the same Apple account as your iOS device and perform the actions we discussed above – in my case anyway, it didn’t really erase my iPad – but you have been warned to make a proper backup.